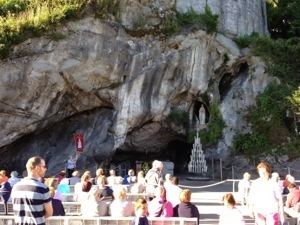 To read about Patricia’s experience in the waters at Lourdes click HERE. Watch the hour long talk from everyone’s favorite sister in Fatima HERE. 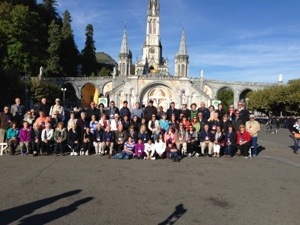 The group of 71 pilgrims have arrived in Lisbon Portugal. Everyone made it safely with no mishaps, no lost luggage and everyone excited for this marvelous spiritual and cultural Catholic adventure! 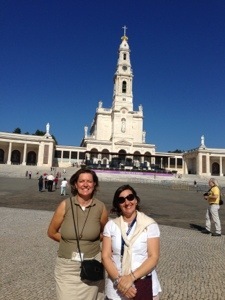 We are now in our elegant Hotel Santa Maria, five minute’s walk from the Shrine of Fatima. 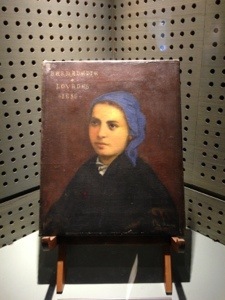 Tomorrow we begin with a tour of the shrine, a walk through the old town of Aljustrel with the three children lived, Mass at the Chapel where Mary first appeared, talk by Sr. Angela who is leading the cause of canonization of Francesco and Jucinta, then the evening prayers and procession at the Shrine. Thanks to Corporate Travel Service for handling all the travel arrangements. What a great day and perfect beginning for this pilgrimage. 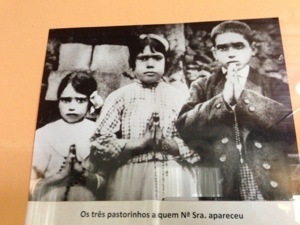 We spent the whole day in Fatima and our local guides were not only extremely knowledgeable but also deeply spiritual. The morning was an intro to the Shrine of Fatima, then walks thru the village and homes of the children, visiting the locations of the apparitions and their parish church, followed by a great lunch and shopping. The afternoon started with Mass at the place Our Lady visited the three children and where the sun danced with 70,000 observers. 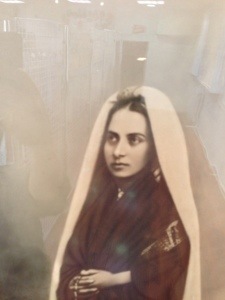 Then the energetic Sister Angela, Rome’s representative for the cause of Blessed Francisco and Blessed Jacinta’s canonization gave us a great summary of Fatima and its message. 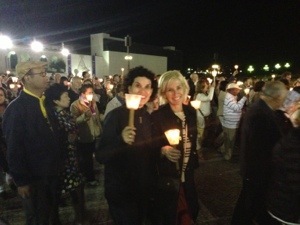 After dinner at local cafes we gathered at the Shrine for the Rosary in many languages and the Marian procession under the stars. The group is doing great and all are well and happy, excited and blessed. 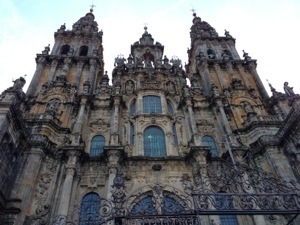 Here is the video of our busy day leaving Fatima and driving to Santiago de Compostela where the El Camino pilgrims are arriving daily. 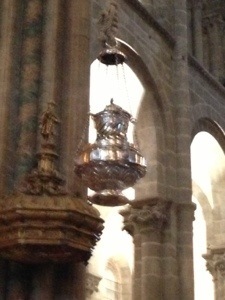 Tomorrow we visit the magnificent church and celebrate Mass with the swinging incensor. Santiago was exceptional! 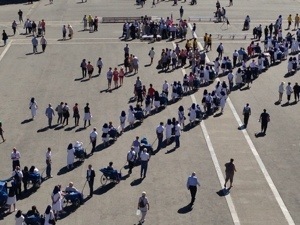 Watching pilgrims come in from hiking hundreds of miles to the tomb of St. James the Apostle was truly inspiring. 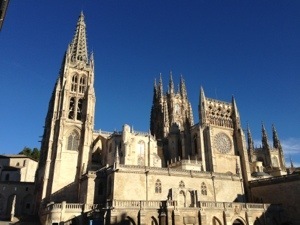 Mass at the Cathedral was also exceptional. Watching the incense burner swinging through the air with eight men operating it spreading incense to the whole church was quite an experience. 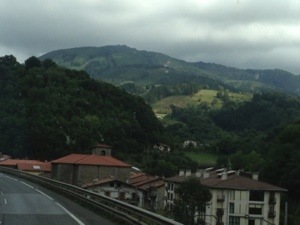 Today we drove across northern Spain and crossed the border into France. 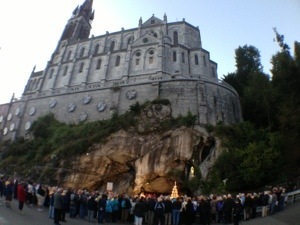 An hour later we arrived at Lourdes. 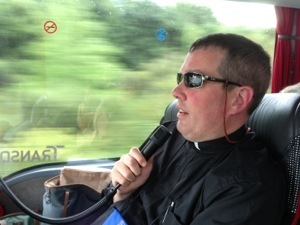 It was a beautiful journey, we watched movies on the bus, pray the rosary, heard vocation stories and even took naps. 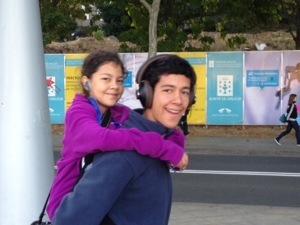 I think you’ll enjoy the video with all the beautiful scenery and interaction with the programs. Started the day early with Mass at the Grotto at Lourdes – where Our Lady appeared to St. Bernadette as the Immaculate Conception. Then breakfast and a VERY thorough tour of the Shrine of Lourdes with our VERY Catholic guides: the grotto, the Shrine, underground church, the museum and much more. We finished the tour of the whole shrine area at noon and everyone had the rest of the day free for confession, cafes, shopping, prayer, bathing in the waters of Lourdes or rest. Another great day at Lourdes, today following the life of Bernadette. Also Farewell dinner, comments and farewells.